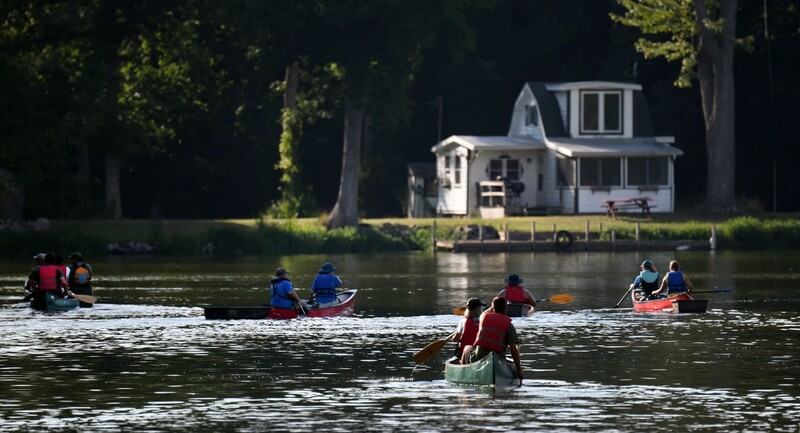 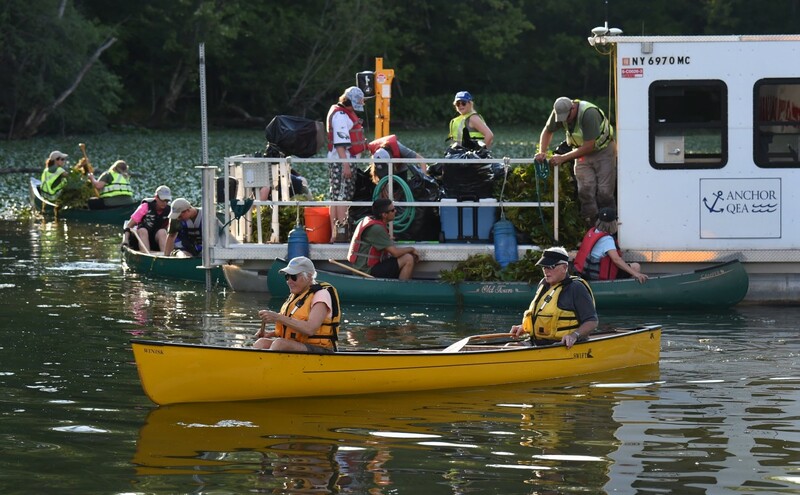 Home » Gallery "Conservation Corps Water Chestnut Removal"
August 2016 - Fifty-eight volunteers came out Thursday evening to have a hand in removing invasive water chestnut. 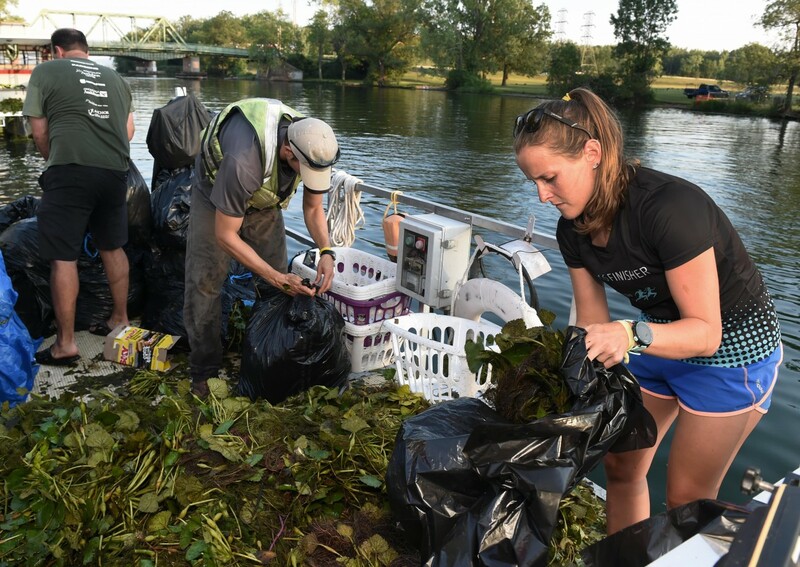 Approximately 5000 pounds of plants were collected from Onondaga Lake and Seneca River. 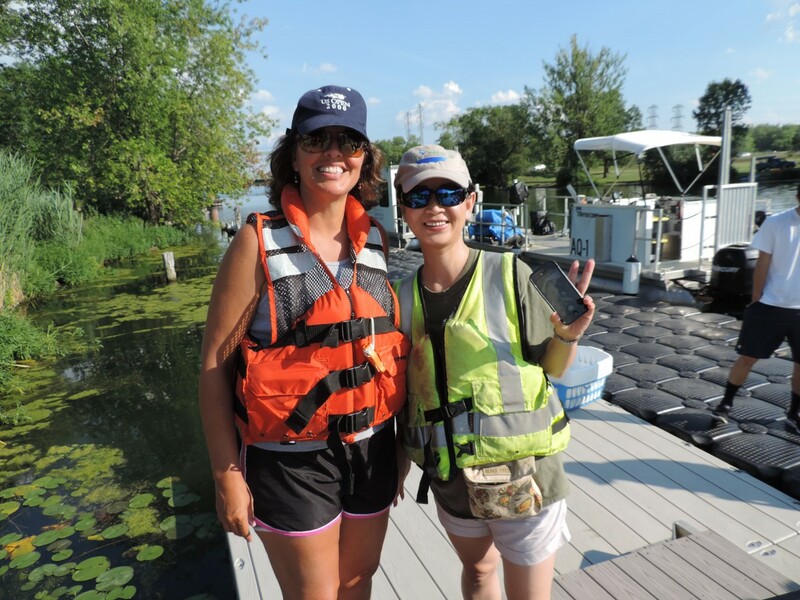 August 2016 - Diane Mantooth (left), a first-time Corps volunteer from Clay, and Lisa Wang, a returning volunteer from Fayetteville, enjoyed working together on a stewardship project that helps our local waterways. 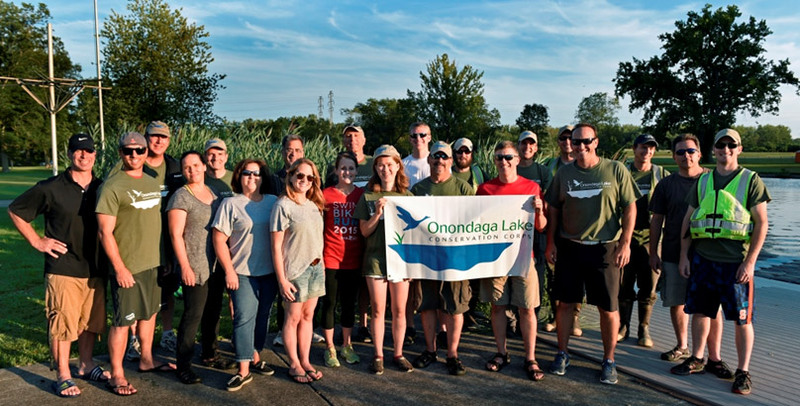 August 2016 - Members of Finger Lakes PRISM, the Partnership for Regional Invasive Species Management, took part in the water chestnut pull. 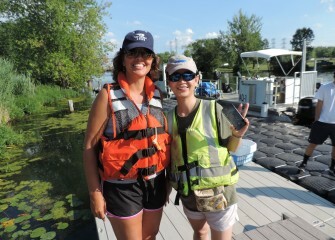 Michelle Henry, left, holds a scale used to weigh bags of water chestnut. 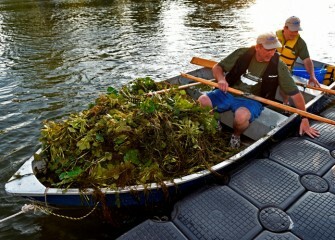 August 2016 - Nancy and Walt Shepard (foreground), from Fayetteville, head back for another load of plants. 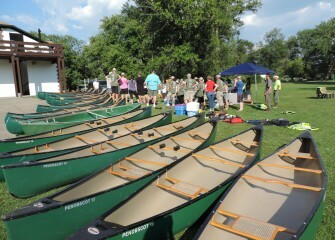 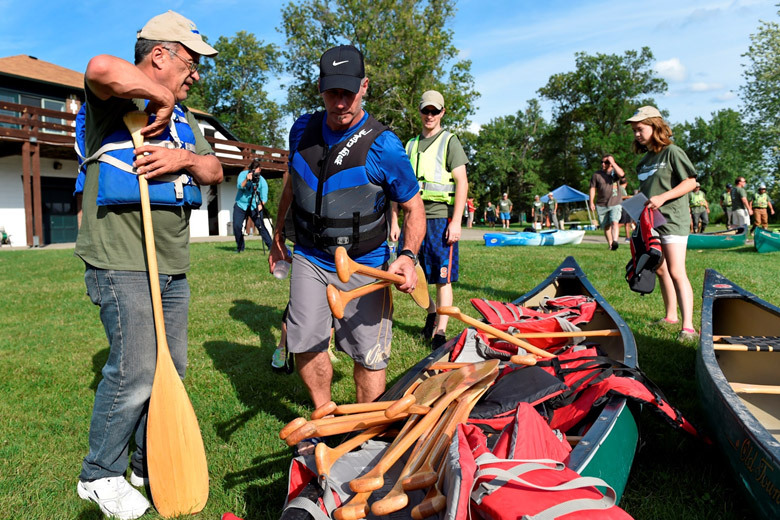 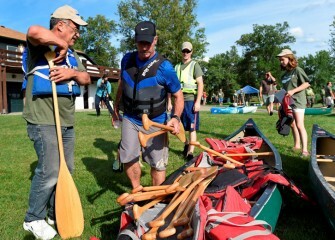 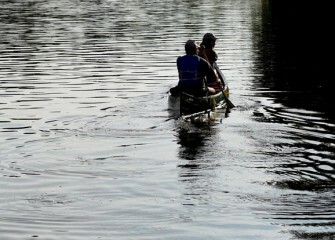 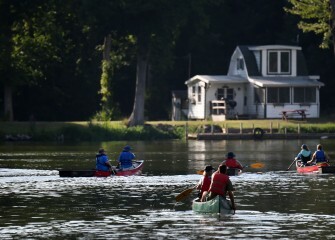 Some participants brought their own canoes and kayaks to help. 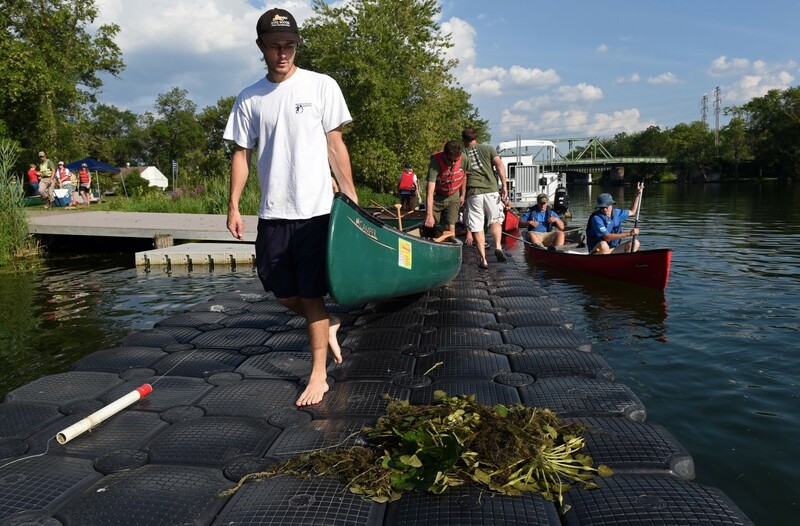 August 2016 - Water chestnut must be bagged for disposal or composted long term away from water bodies. 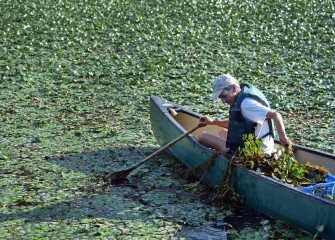 Seeds can survive for years. 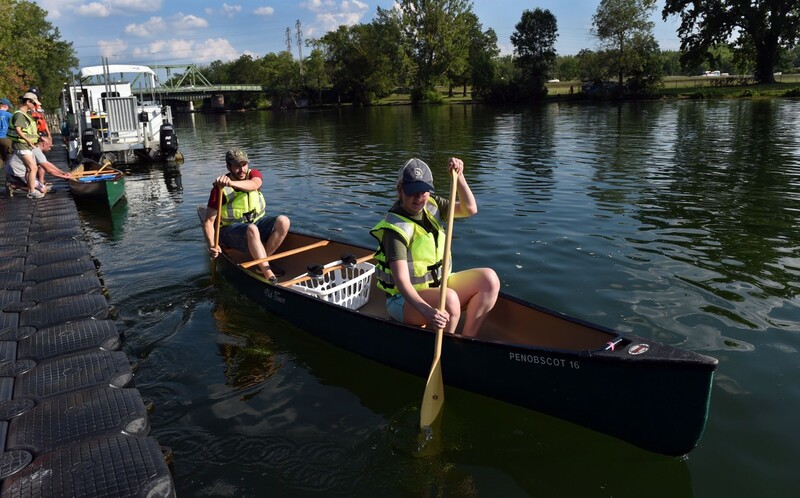 August 2016 - Canoeists unload water chestnut to a support boat operated by Onondaga Lake Conservation Corps corporate partner Anchor QEA. 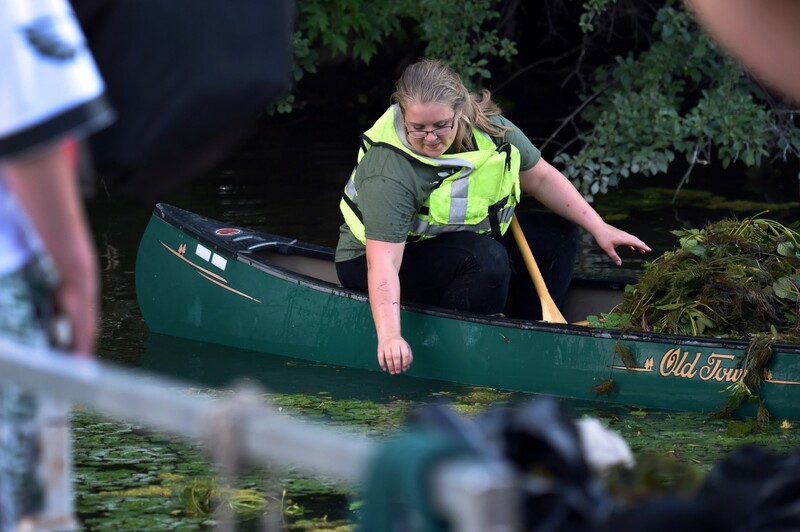 August 2016 - Rose Boerschlein from Ontario, NY, reaches to remove a water chestnut plant. 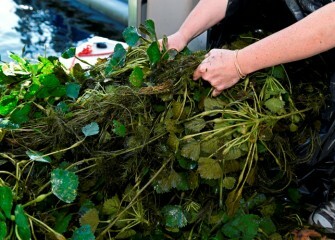 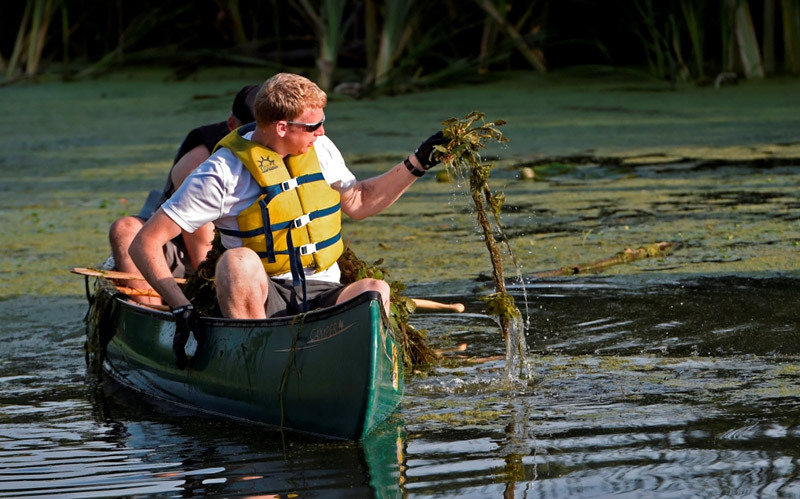 Removing by hand is relatively easy, and is a safe and effective method for controlling the invasive plant. 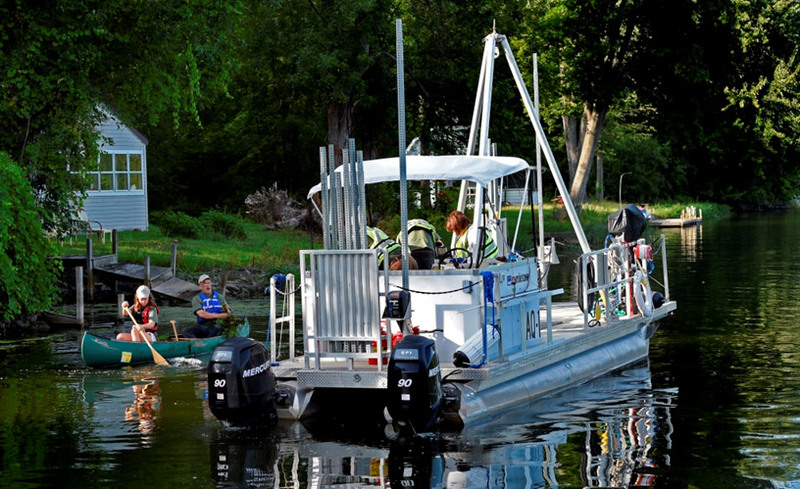 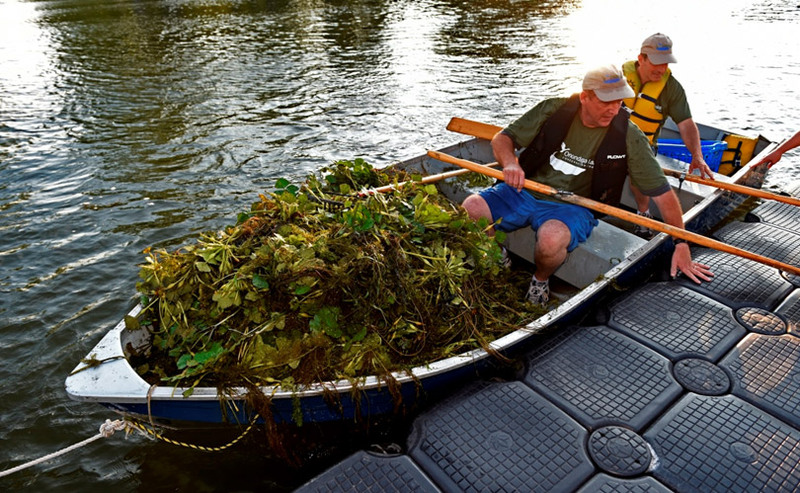 August 2016 - Removing invasive species also opens up waterways for improved recreational use. 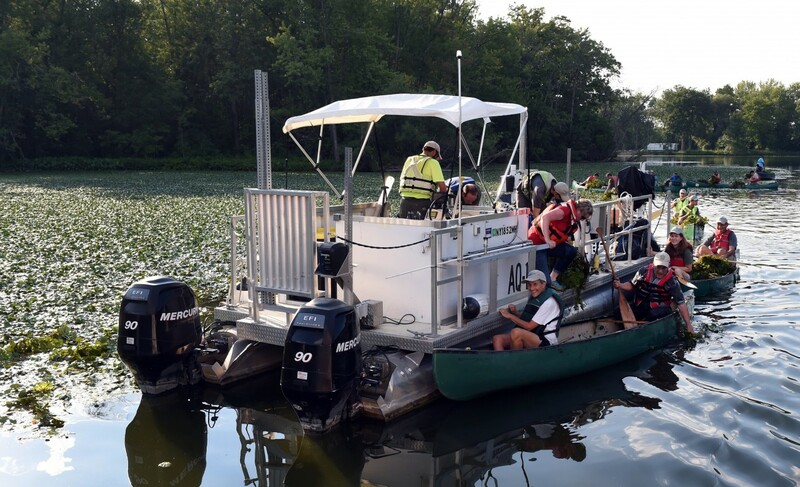 August 2016 - Water chestnut can grow into a canopy that blocks light below and chokes out aquatic vegetation, resulting in lower dissolved oxygen necessary for fish to survive. 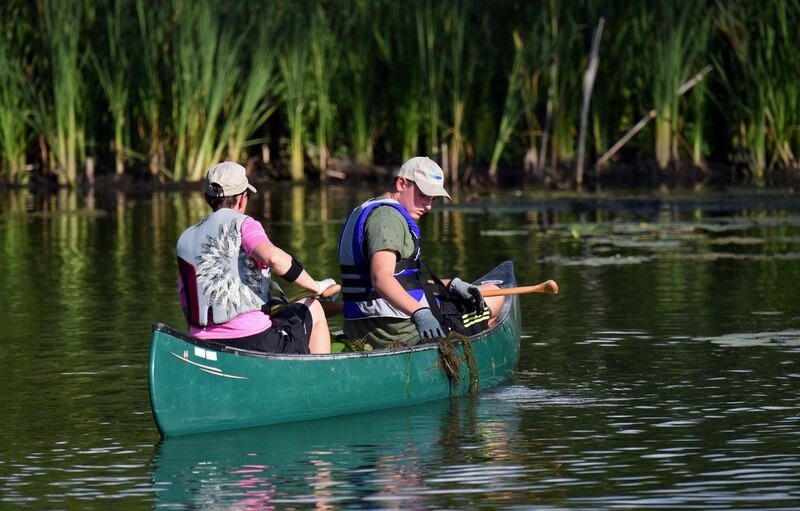 August 2016 - Anita Freezman and son Ian (right), from Syracuse, keep an eye out for stray water chestnut plants near shore. 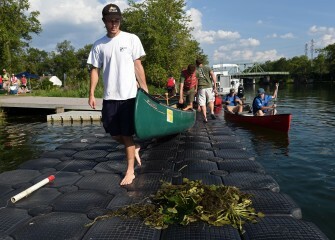 August 2016 - Past Klein Island participants find an area filled with a thick mat of water chestnut plants. 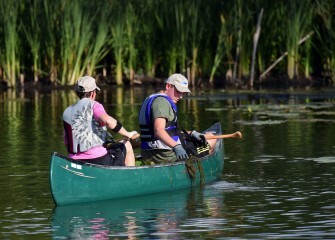 August 2016 - Rick Betty and Cari Brazie, from Brewerton, push off to head down Seneca River where most of the water chestnut will be pulled. 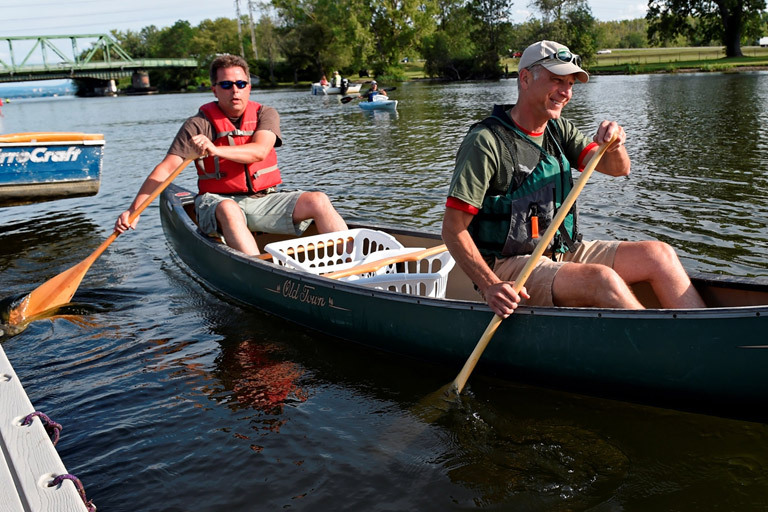 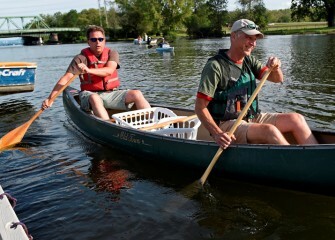 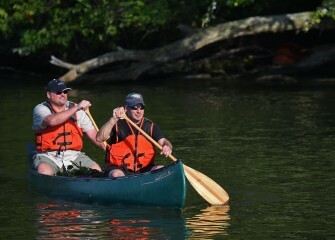 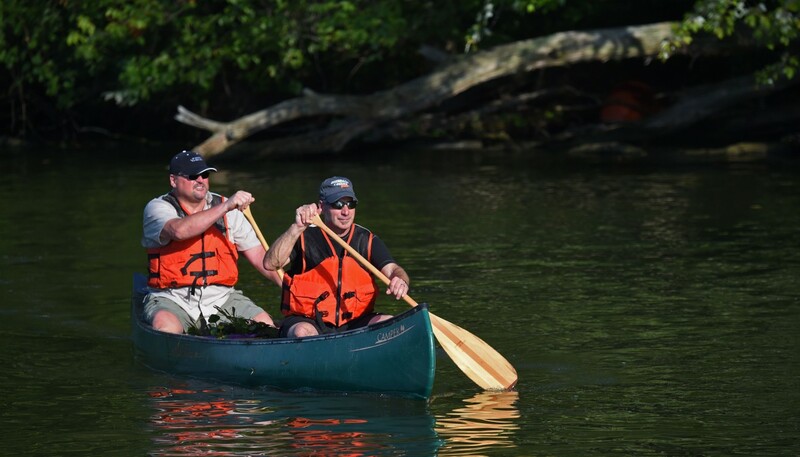 August 2016 - Jim Rhea (left), Principal Engineer and Partner at Anchor QEA, and Dave Fergot, Deputy Commissioner of Onondaga County Parks, continue down Seneca River in search of more water chestnut. 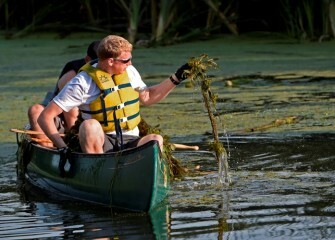 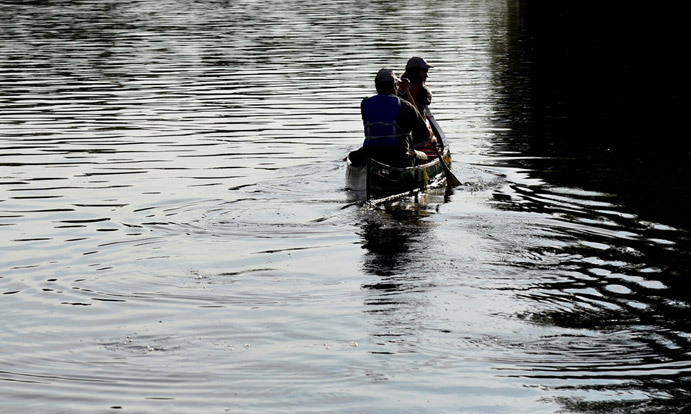 August 2016 - Nick Glaza (left) and his father Ed, of Skaneateles, carry their canoe out to launch, passing by sample water chestnut plants on the dock. 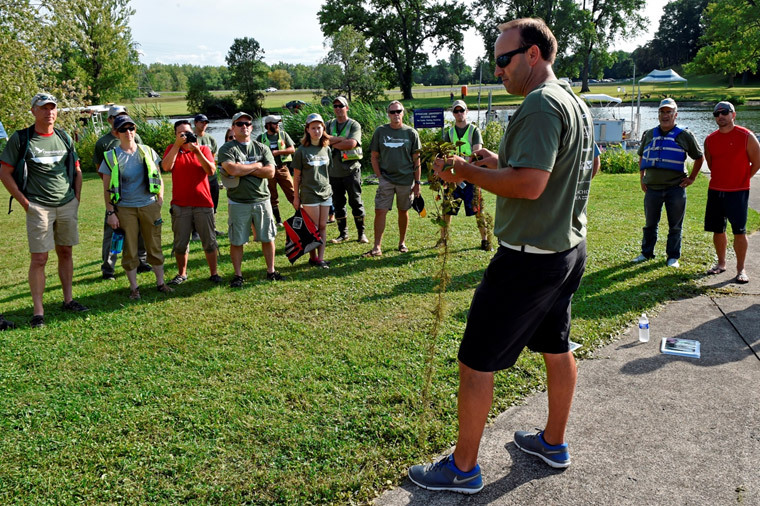 August 2016 - Joe McMullen (left), habitat expert with OBG, shows volunteers a sample water chestnut plant (Trapa natans). 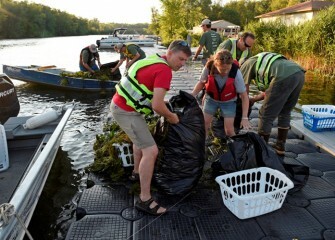 Waterproof cards with information about the invasive plant are distributed. 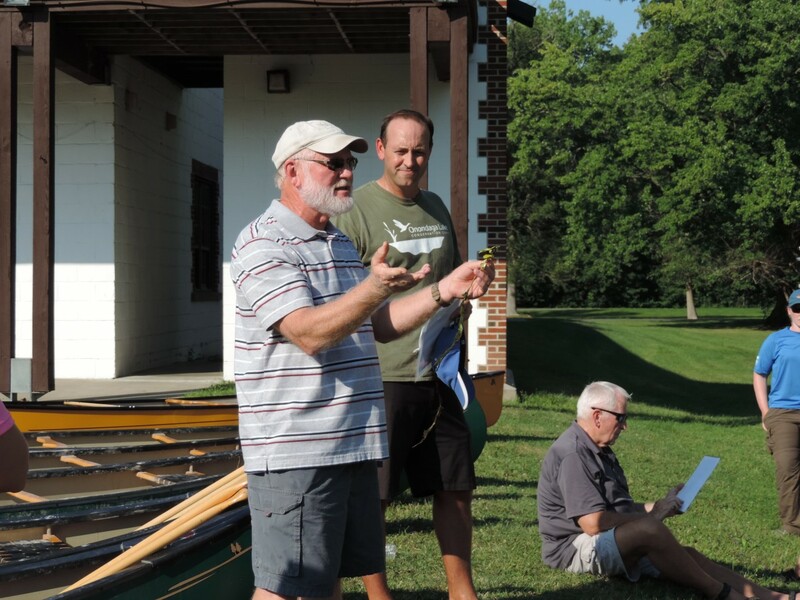 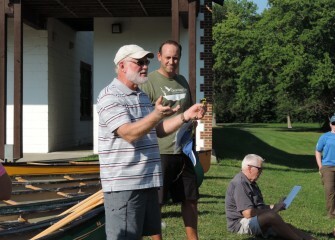 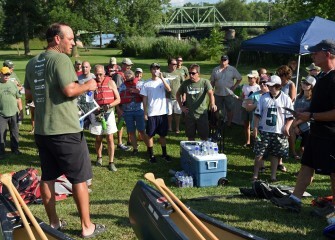 August 2016 - Tim Johnson (left), Senior Managing Scientist at Anchor QEA, welcomes volunteers and orients them to the evening’s action plan. 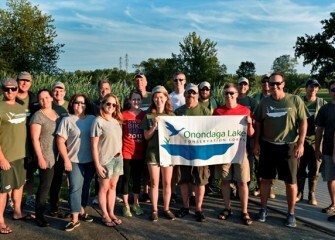 August 2016 - Participants gather at the second annual Onondaga Lake Conservation Corps water chestnut removal event on Thursday evening, August 4. 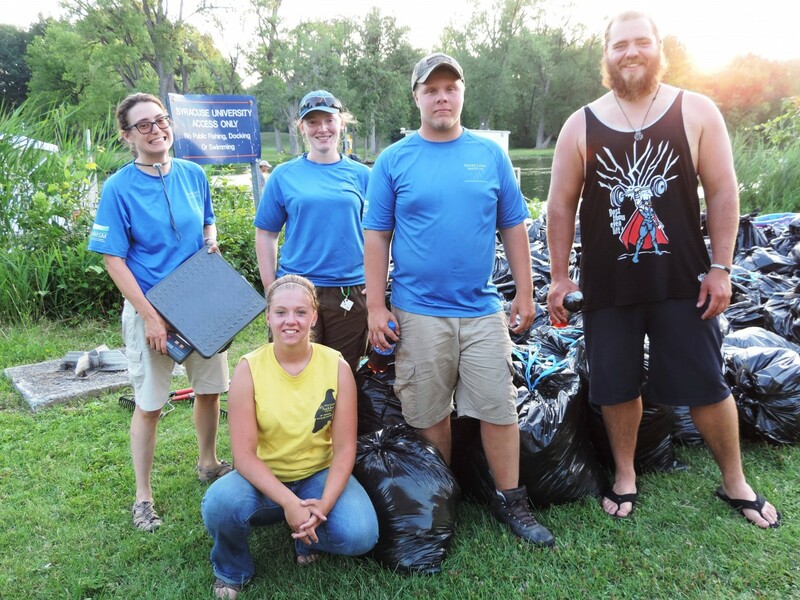 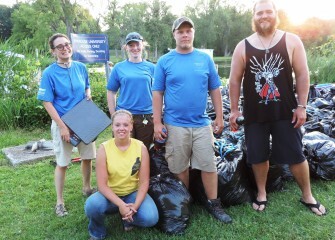 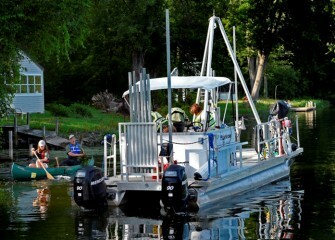 August 2015 - Volunteers collect equipment near the Syracuse Chargers Boathouse. 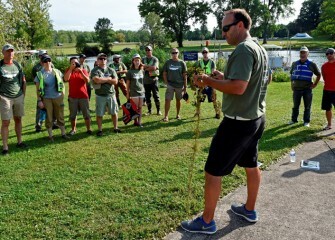 August 2015 - Tim Johnson, Senior Managing Scientist at Anchor QEA, shows volunteers how to identify European water chestnut. 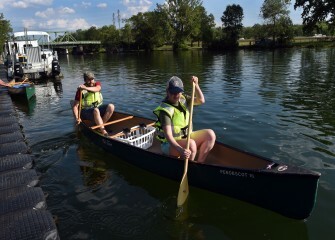 August 2015 - Ed Glaza (left), Senior Project Manager at Parsons, and John McAuliffe, Honeywell Syracuse Program Director, push off from the dock. 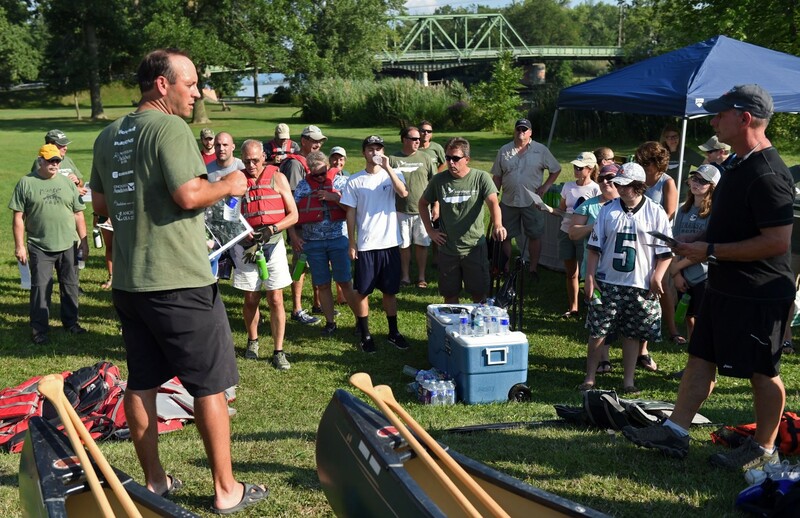 August 2015 - Volunteers fan out along the shoreline of Seneca River from the mouth of Onondaga Lake to Klein Island. 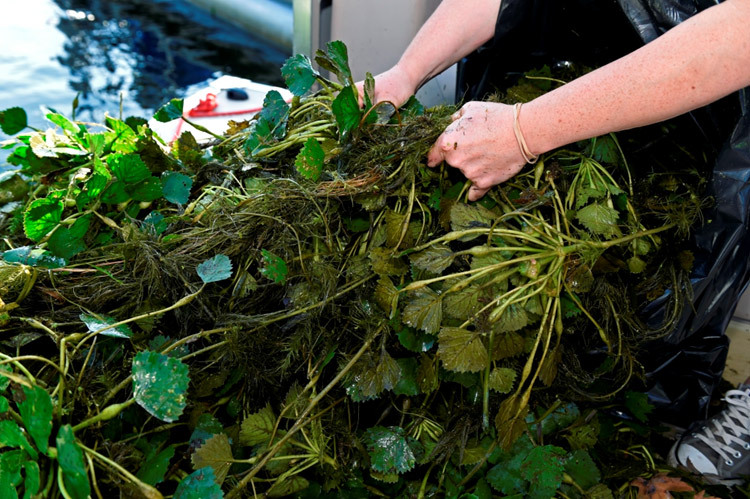 August 2015 - European water chestnut (Trapa natans) was introduced into northeastern U.S. waterways in the 1800s. 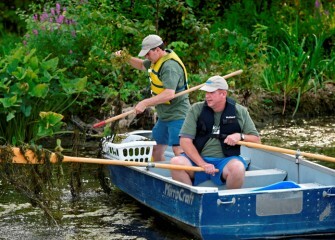 Dense mats reduce oxygen in the surrounding habitat for fish and choke out other native species. 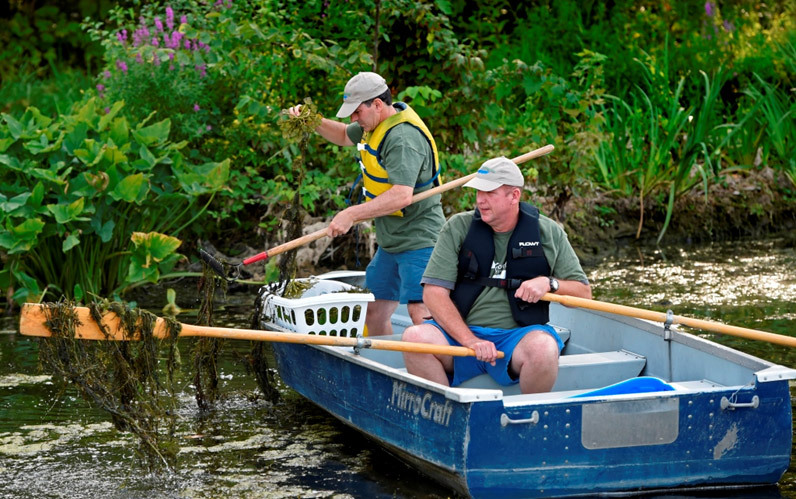 August 2015 - Water chestnut can also clog waterways and shoreline aquatic habitat important for fish, birds and other wildlife. 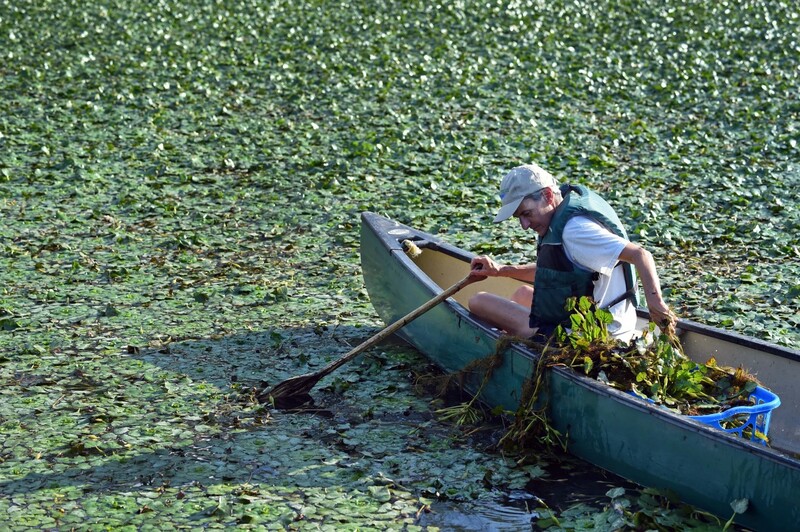 August 2015 - Removing water chestnut allows for greater biodiversity, contributing to a healthier ecosystem. 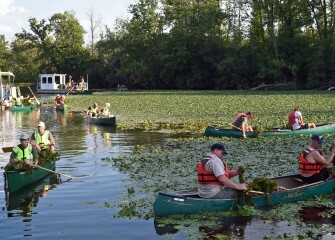 August 2015 - Several larger boats, such as this vessel belonging to Anchor QEA, circulated among volunteers, picking up loads of water chestnut. 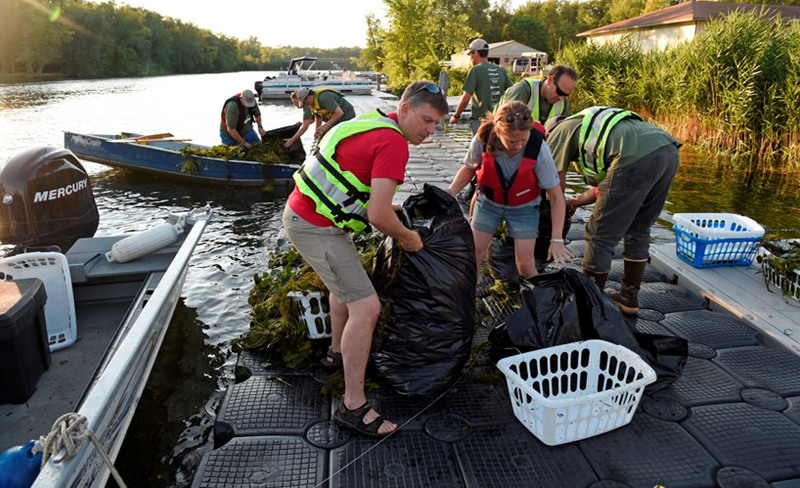 August 2015 - Removing invasive species is an important aspect of stewardship of Onondaga Lake and its watershed. 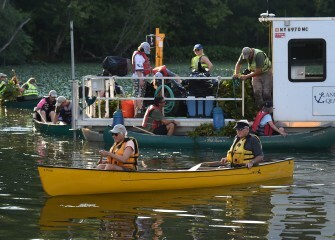 August 2015 - Corps volunteers removed over 2,200 pounds – more than one ton – of invasive European water chestnut on August 6. 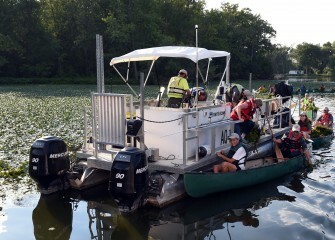 August 2015 - Efforts over the years to remove water chestnut are showing positive results. 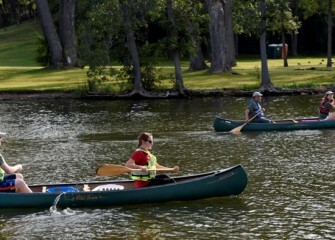 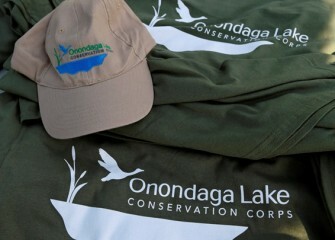 The Onondaga Lake Conservation Corps is now joining in these efforts. 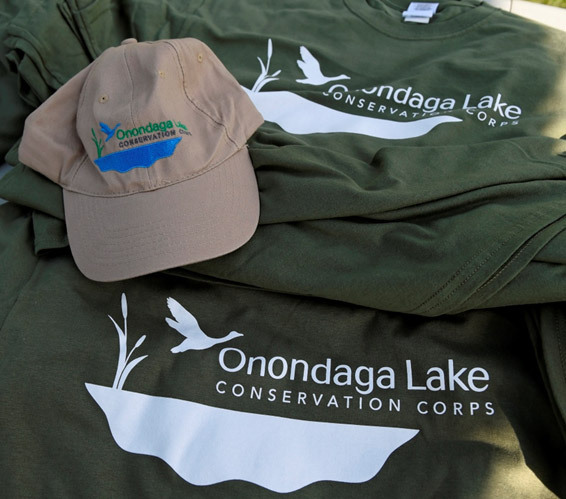 August 2015 - Onondaga Lake Conservation Corps seeks to inspire future stewards of Onondaga Lake and its watershed through a hands-on, experience-based program. 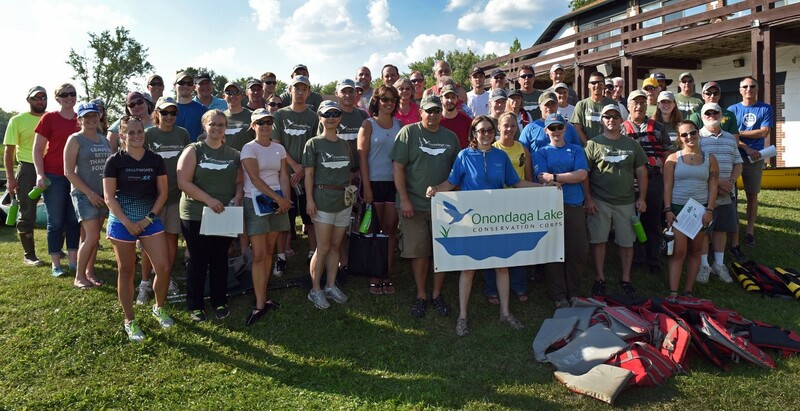 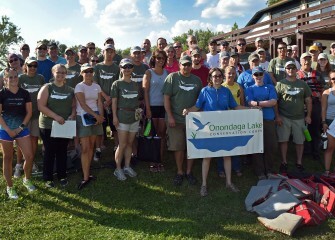 August 2015 - Onondaga Lake Conservation Corps volunteers gathered on a Thursday evening to help protect Onondaga Lake’s biodiversity.